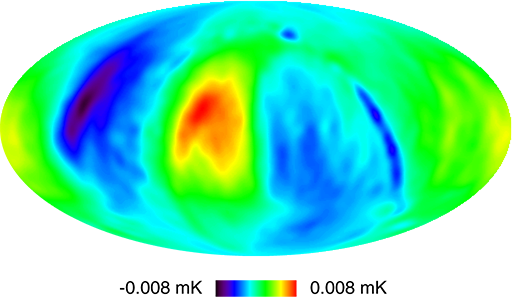 WMAP Three-year Paper Figures, Jarosik et al. 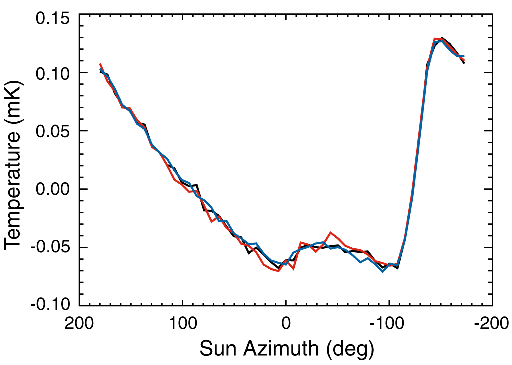 The temperature of the middle of the B side primary mirror vs. the Sun azimuth in the spacecraft coordinate system. 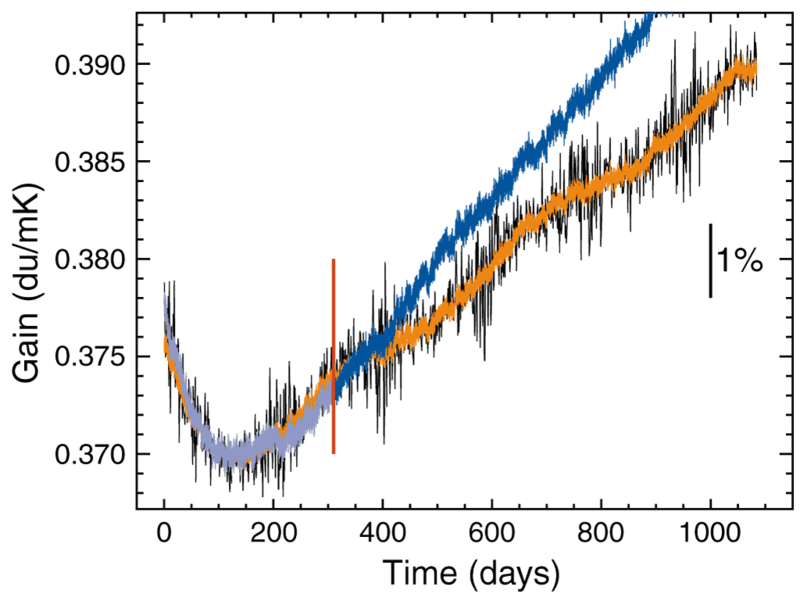 The red data were taken during the first year of observations, the black during the second and the blue during the third. 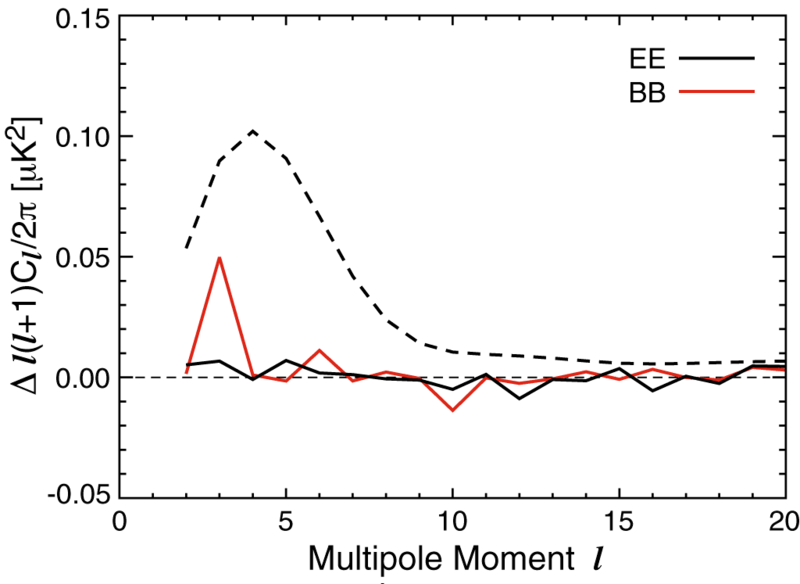 Comparison of the hourly gain determinations (black) based on measurement of the CMB dipole to two different versions of the radiometer gain model. These data are for the V223 detector and the time range spans the three years of WMAP science data collection. 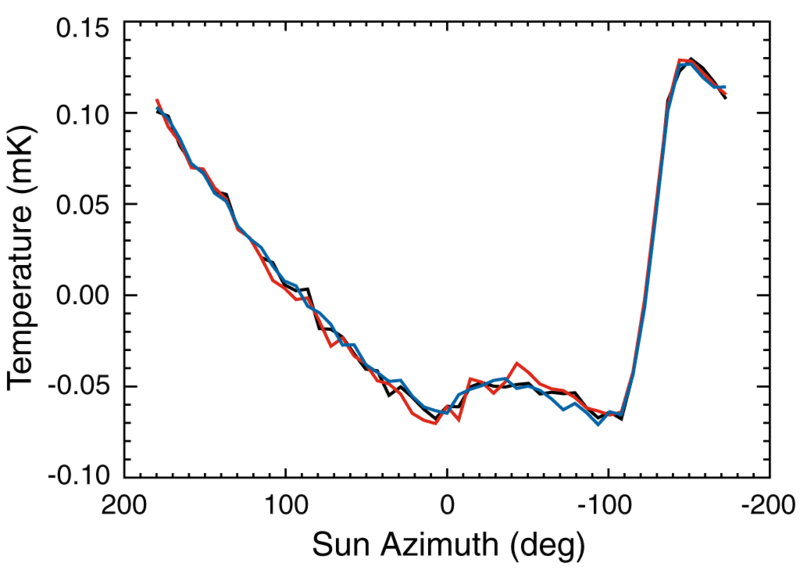 Difference between the temperature sky maps produced using two different gain models. 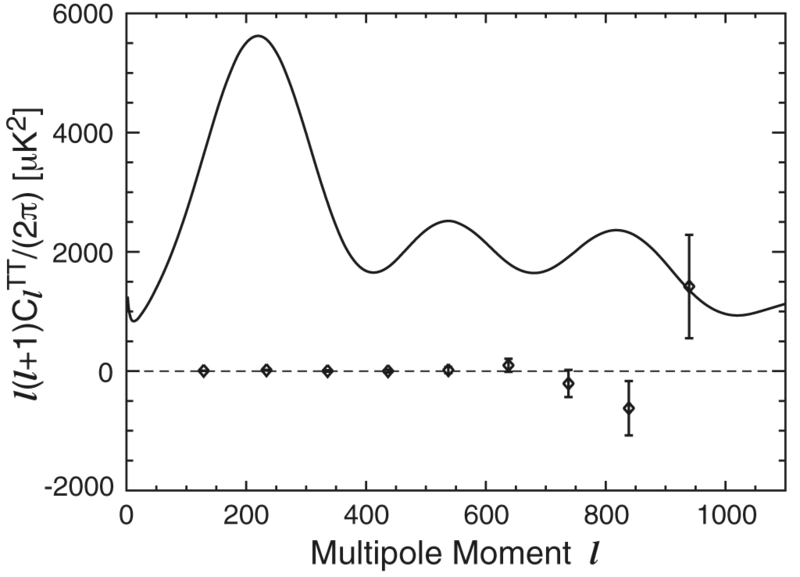 Raw data from from the V2 differencing assembly for year-1 was processed both with the original (year-1) and the improved (three-year) gain models. 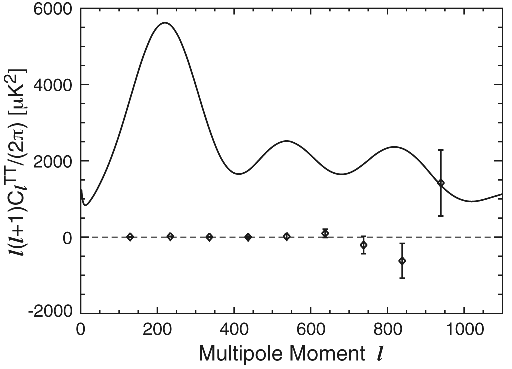 Amplitude of the quadrupole difference between temperature maps produced using the original and improved gain models. 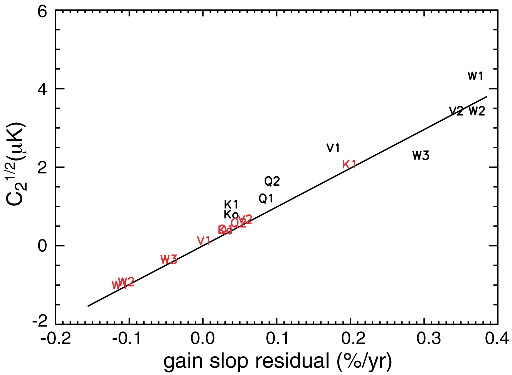 The horizontal axis is the difference between the mean slopes of the gain models. 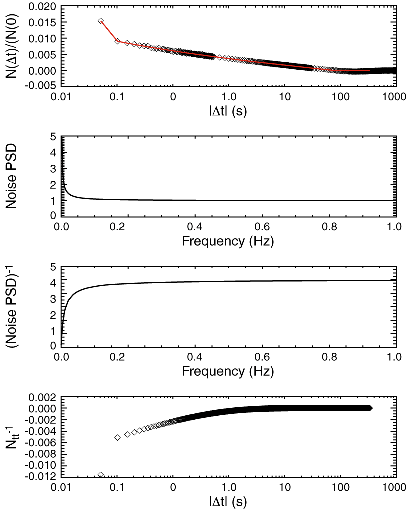 Noise and Filter Properties of the W11 Radiometer. 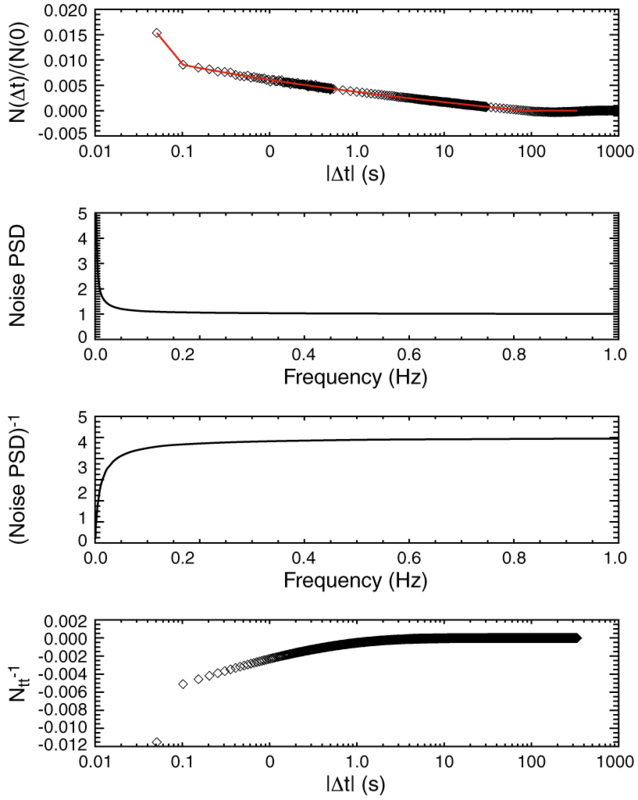 The top panel displays the measured autocorrelation function of the W11 radiometer noise (black diamonds) and the parameterized fit to these data (red line) as described in § 2.5. 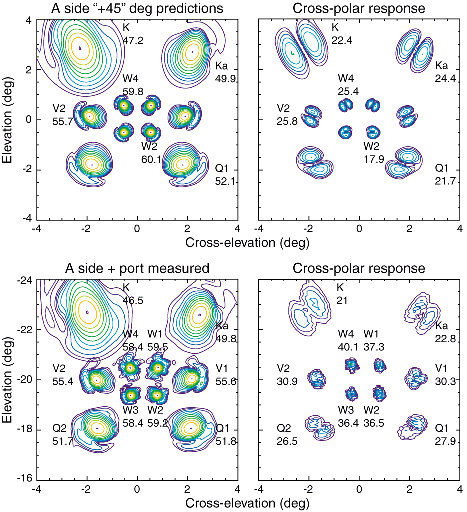 Predicted (top) and measured (bottom) focal plane for the A side for the co- and cross-polar beams. The contours are spaced by 3 dB and the maximum value of the gain in dBi is given next to selected beams. 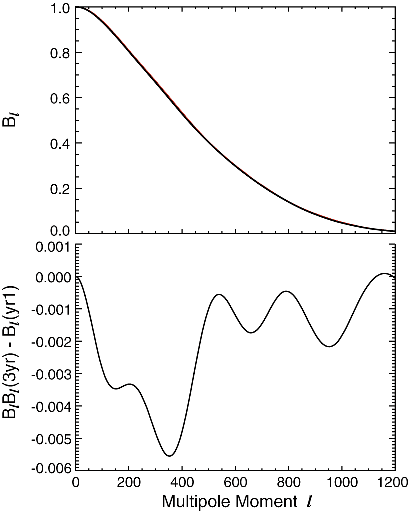 Left: Profile of the A-side V2 band beam comparing year-1 (black), three-year combined (red), the model of the beam (green), and the Hermite fit to the beam profile (blue). 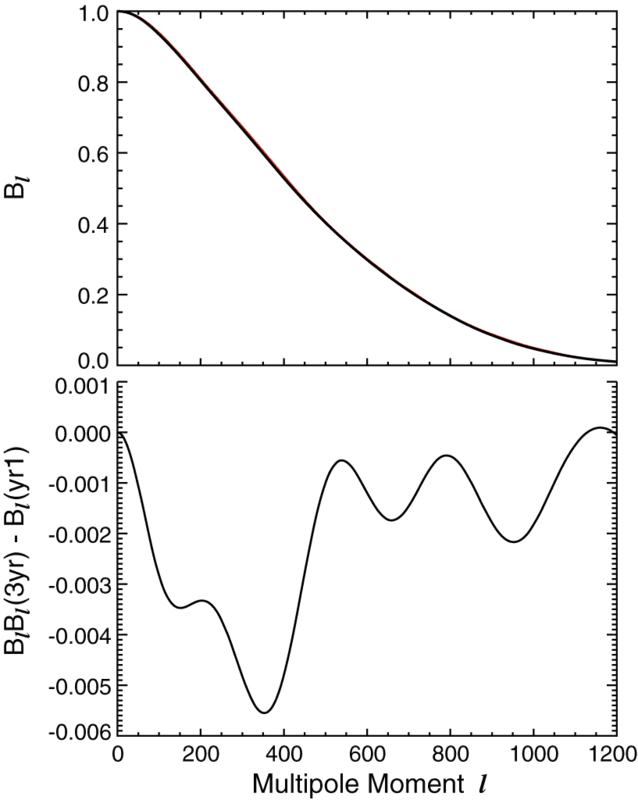 Right: The accumulated solid angle as a function of radius for A-side V2. 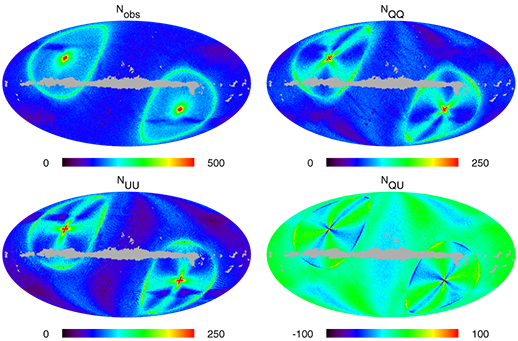 The beam transform for the A side of the V2 DA, comparing first-year and three-year results. 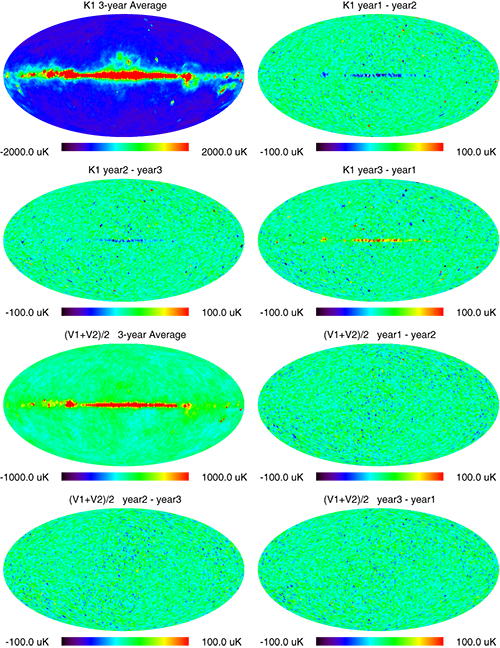 The top panel shows the beam transform from both the first year (red) and three-year (black) analysis - they are nearly indistinguishable at this level. 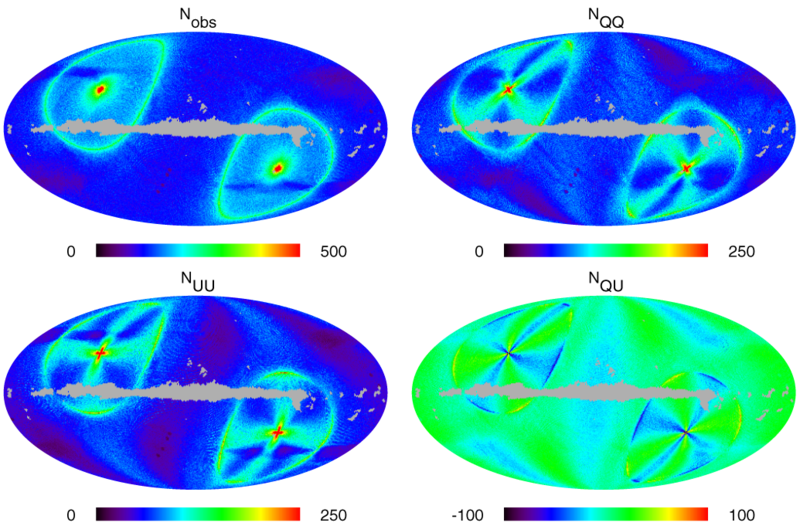 Beams in the WMAP focal plane. The top panel shows the measured beams, the middle panel shows the beam model, and the bottom panel shows the residuals. 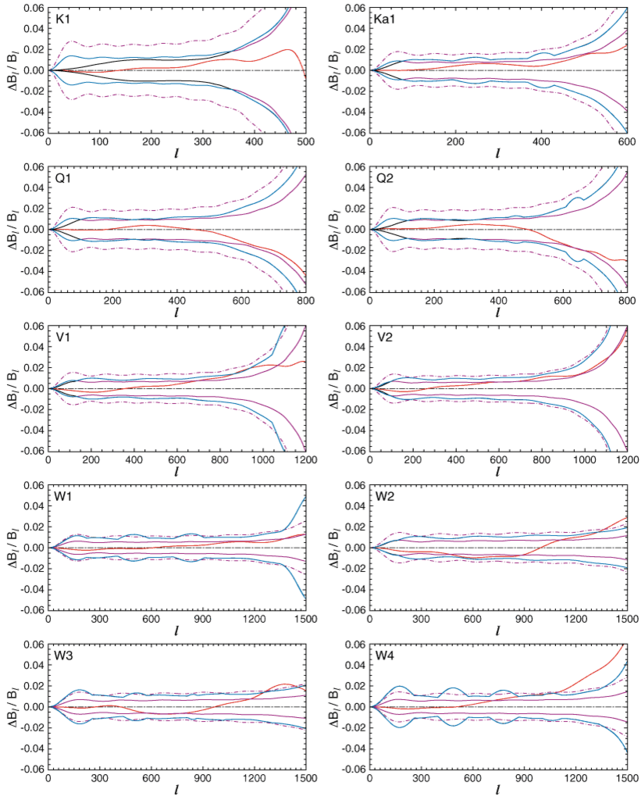 The uncertainties of the beam transform functions for all bands. The uncertainties of the window functions are double these. 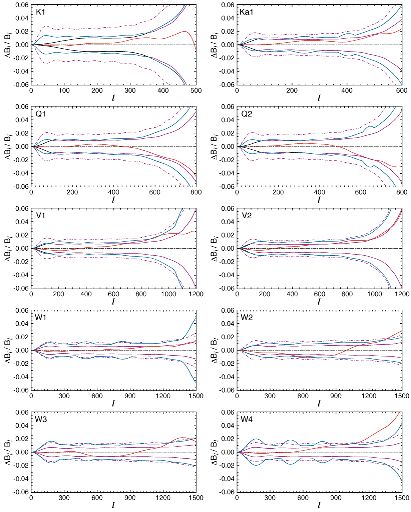 The cyan lines are the new uncertainties. The black line is the uncertainty for year-1. Schematic overview of the Three-year WMAP sky map processing pipeline. 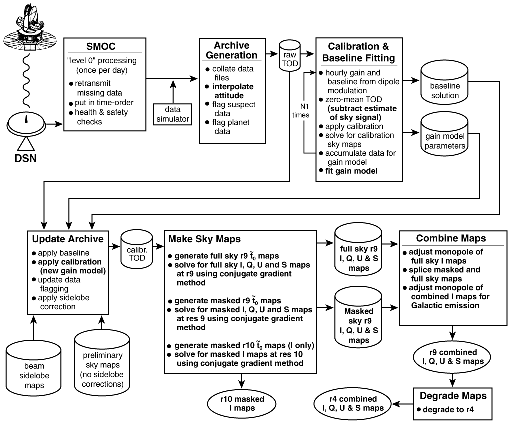 Substantive changes from the year-1 processing (Hinshaw et al. 2003a, Figure 1) are indicated in boldface. 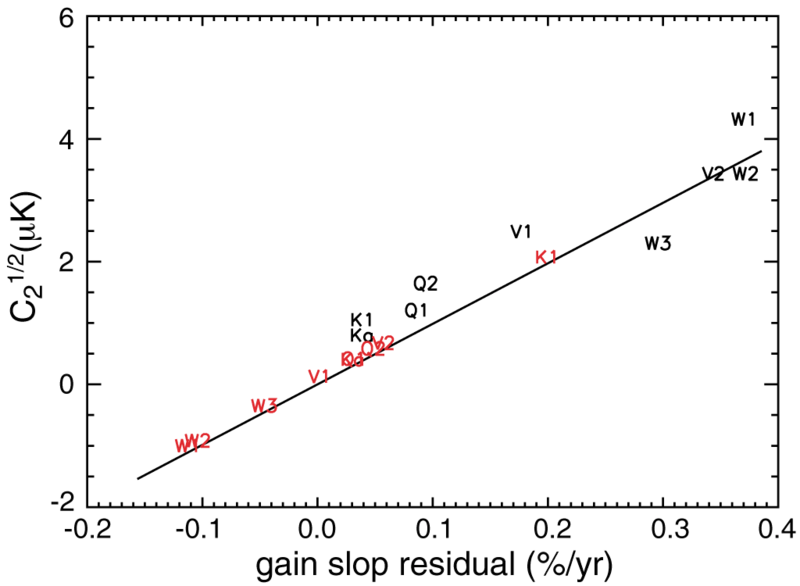 Difference between the low-l polarization power spectra with and without removal of the transmission-imbalance modes from the N-1 matrices. 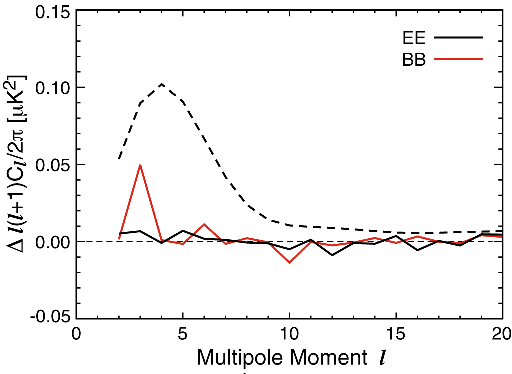 The black and red lines are the differences between the power spectra of combined Q-band and V-band polarization data for the E and B modes respectively. 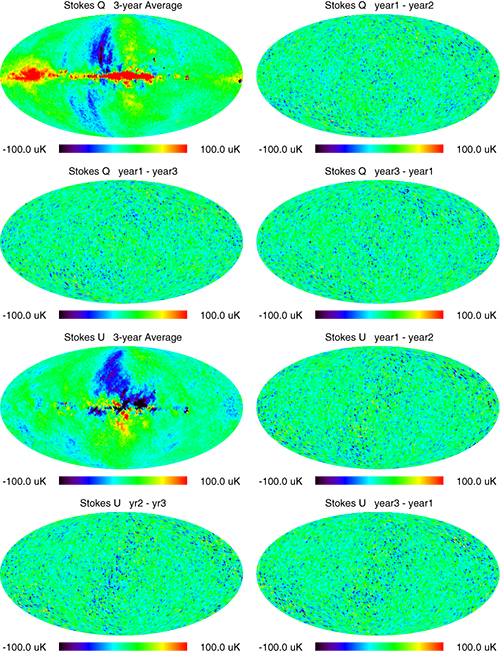 Maps of the Nobs, NQQ, NUU, and NQU weights for K band year-1 spm sky coverage. 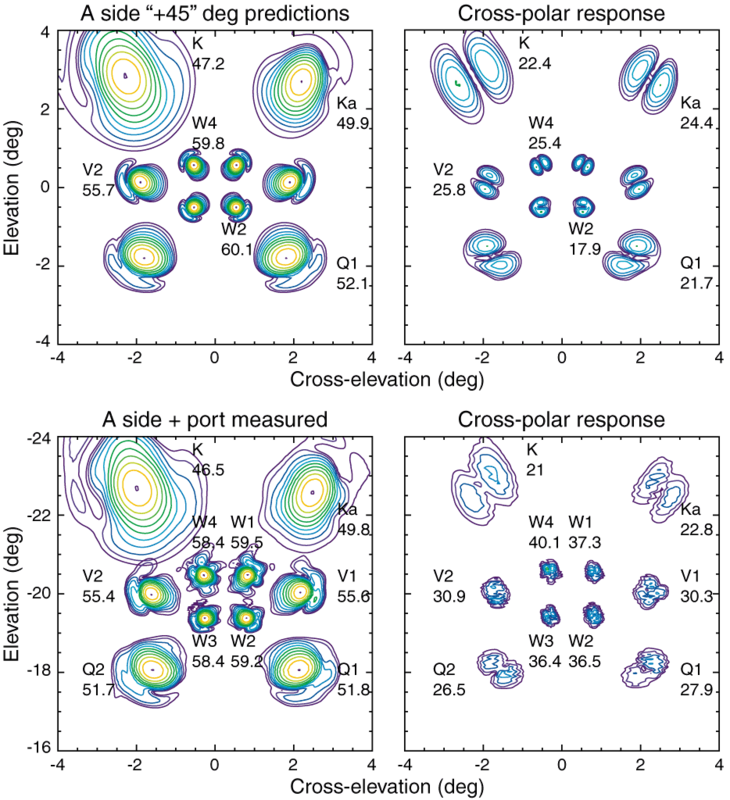 These maps are measures of the noise covariance and are used when the maps are degraded from r9 to r4. 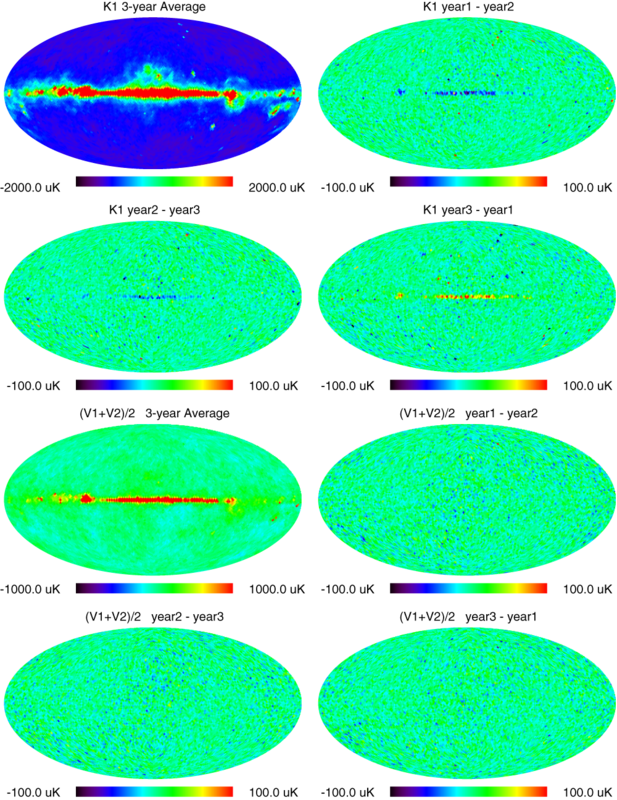 Cross power spectrum of year-1 and year-2 null maps. 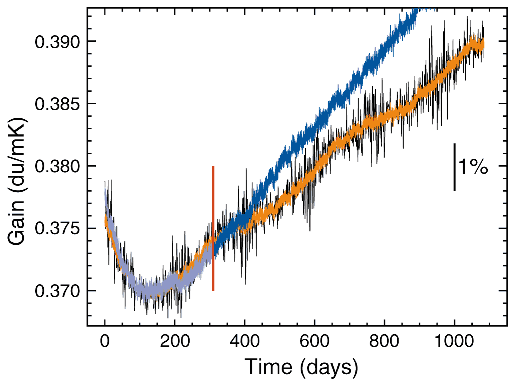 For each year Stokes I null maps were formed for DA combinations ((V1-V2) + (W1-W2) + (W3-W4))/6, and the year-to-year cross spectrum calculated. 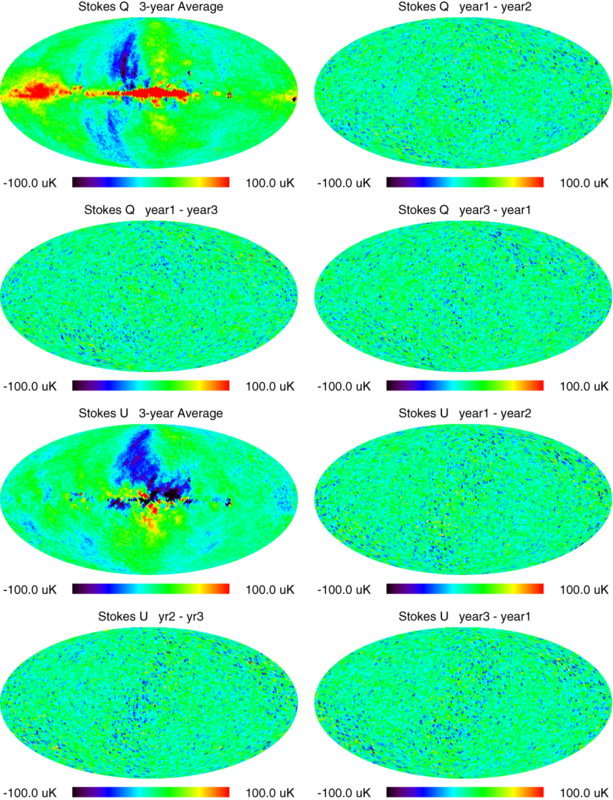 WMAP Three-year combined and year-by-year difference maps of Stokes Q (top 4 panels) and U (bottom 4 panels) for K-band. 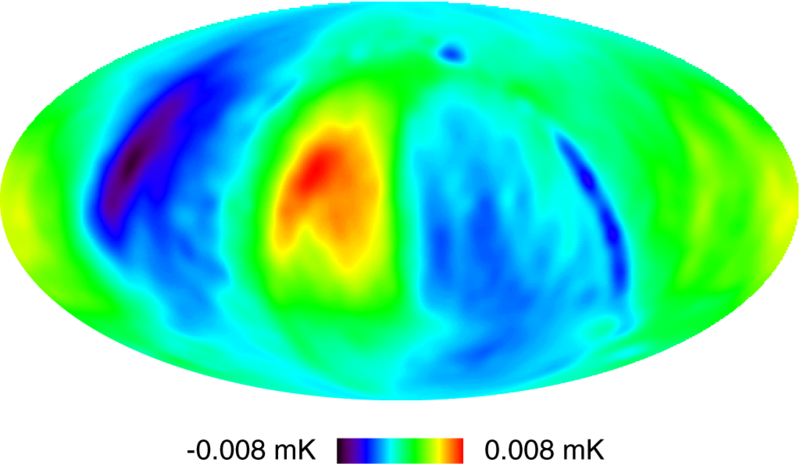 Galactic foreground emission is clearly visible in both Stokes Q and U of the three year combined maps.